My trip started with landing in Louisville late Thursday night. Right away you know the city is horse racing heaven. 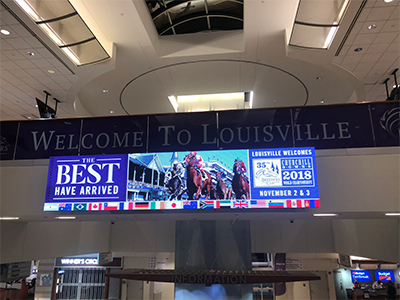 From the flags depicting racing silks hanging above the gates to the Breeders' Cup banners all around the airport, you can't help but get excited. They even play the call to the post when your baggage arrives at baggage claim. Parking was actually quite easy. They offered free park and ride from Cardinals Stadium, which is just a few blocks away from Churchill. You just park and hop on a shuttle and it's all free. No need to fight the traffic or pay for a parking pass. The shuttle drops you off right near the Paddock Gate, so it's super easy. They even had some live entertainment while you waited for the gates to open. If there's one thing I've learned about visiting Kentucky, you never know what the weather is going to be and there's always a little rain involved. While many were dressed to the 9s in their flashy suits and dresses with hats, there were several people dressed for the weather. I highly recommend dressing for the weather and wearing comfortable shoes. There was a lot of shivering going on today with a morning temperature of 45 degrees. However, keep in mind that your section might have a dress code, so definitely follow the dress code! This information is all provided on the Breeders' Cup website. The first day of the Breeders' Cup was dubbed "Future Stars Friday." The day started with three undercard races - an allowance claiming, a maiden and race 3 had a bit more complicated conditions for $86,000 in purse money. But, that third race had past Kentucky Derby contender PATCH in it! Patch, the one eyed horse, trained by Todd Pletcher was also the favorite but was out raced by CASINO STAR. With these early undercard races, I highly recommend you use the time to get your bearings. I got to the track a little too early. The gates didn't open until 10am, so I was waiting for a good 30 minutes and then the first race wasn't until 12:55pm. However, this is a good time to get the lay of the land. Figure out where your seats are, or if you have general admission tickets, figure out where those tickets allow you to go. There were two general admission options. One was basic GA and the other was the Clubhouse Walk upgrade. I recommend going for the upgrade and buy both days together. If you're going with a group of people, try to get together and buy a box either in the lower or upper Clubhouse sections. Some of those sections would only allow you to purchase in packages of six or more. Saying that, the upper Clubhouse areas offer the best views. Another small, but important feature of the Clubhouse was the fact that they have USB charging points along the wall across from the concessions. This is a lifesaver because your phone will be dying by Race 4! The Clubhouse is also conveniently located near the Paddock. The Paddock is my favorite place. It's a great way to see the horses up close. Like really up close. 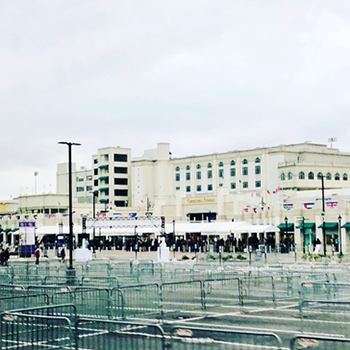 As the day went on and more people began to arrive and it could be tough to get on the rail, but just be patient and weasel your way in. Overall everyone was very polite and once they've made their wagering decisions will move out of the way so others can get closer. Aside from being able to see the horses and get great pictures, use this time to watch them walk. You might very well be turned off of your original bet after seeing the horses in the Paddock. For example, in the first race, the 5 horse, ENTHRALL did not look right to me. He was very stiff in the hind end and didn't look comfortable. A racehorse should have a nice flowing walk with free shoulder movement. 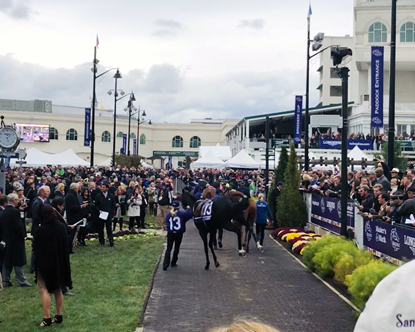 I did notice that the spongy nature of the footing in the paddock made them all walk a little differently, but you'll notice if they are "off." Also pay attention to their attitudes. 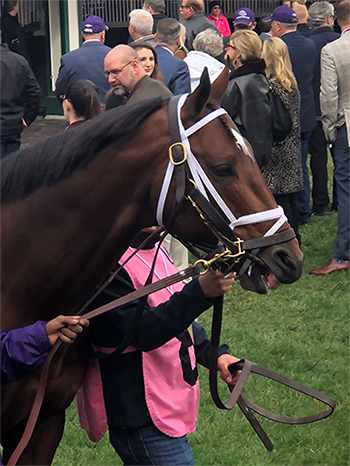 Some racehorses act out because they are "on the muscle" but if they've made it this far in their careers (even the young ones), they are typically used to the hustle and bustle around them and able to concentrate on the task at hand. Horses that are bucking and kicking out, might not be ready to run their best. A good example of that was the #13 horse in Race 8, MARIE'S DIAMOND. He was a very naughty boy in the paddock, throwing in some hard bucks. He finished 4th from last and "failed to menace." The other benefit of hanging out at the paddock is to listen to what the other horse players have to say. There are a lot of knowledgeable people there. Do a bit of eavesdropping. You never know what you might learn! As one very knowledgeable horse player stated, "Never bet against Chad Brown." Chad Brown's trainee NEWSPAPEROFRECORD delivered in gate to wire fashion in Race 6, the Juvenile Fillies Turf. They also tend to point out the trainers that you wouldn't recognize right away. After all, they don't all have Bob Baffert's white hair! 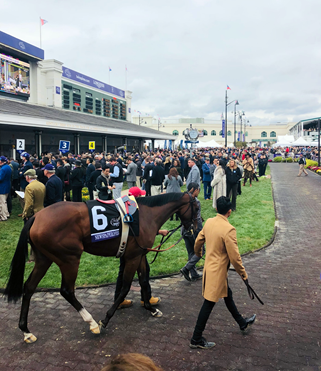 You might even spot a few celebrities in the paddock, as the owners tend to congregate in the middle to take pictures and wish their horses well. 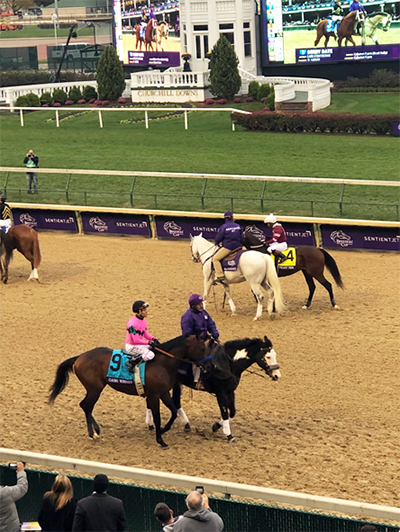 The Breeders' Cup is literally the best of the best, which can make for some hard decisions on race day. It helps to have a guide to provide you with the research in a condensed and concise manner. The GuaranteedTipSheet.com Breeders' Cup Wagering Guide was a handy tool to have on hand and provided some great reading on the flight to Louisville. Race 4 of the day was the Street Sense Stakes worth $100,000. 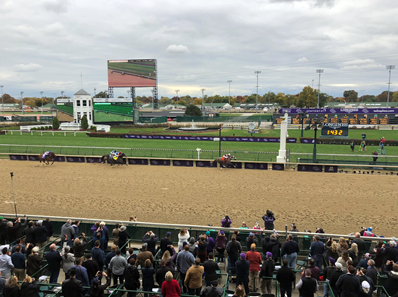 This was an exciting race and a primer for the Breeders' Cup card to come. In the first quarter,TROPHY CHASER held the lead and set the pace with fast fractions. At the top of the stretch, he dueled with IMPROBABLE, but IMPROBABLE, trained by Baffert, broke way to win by several lengths. DISTANT SHORE finished third. This was the first running of the Juvenile Turf Sprint for 2 year olds. One of the favorites, SHANG SHANG SHANG had been scratched that morning and BIG DRINK OF WATER filled his spot. 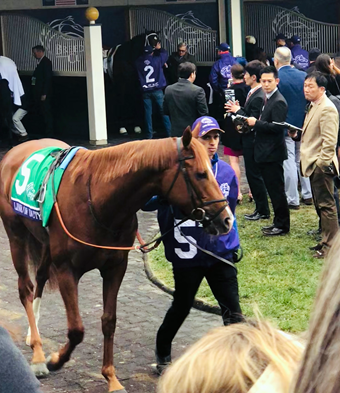 There was a lot of chatter at the Paddock about the 5 horse, a chestnut named BULLETIN and trained by Todd Pletcher. At the break, BULLETIN was off like a bullet. At the top of the stretch, he battled with CHELSEA CLOISTERS, but he was gone at the wire winning by three lengths with CHELSEA CLOISTERS placing second and SO PERFECT for the show. Fillies on the turf pretty much spells Chad Brown. Seriously, he's on fire with fillies on the turf and once again, the word at the Paddock was "You can't bet against Chad Brown." That was a very correct and knowledgeable man! NEWSPAPEROFRECORD went gate to wire and never looked back. She was never really challenged with EAST and STELLAR AGENT placing second and third consecutively. This was another exciting race with the fillies and there appeared to be so many good options. JAYWALK really stood out in the paddock. She was calm and just had an aura of a winner about her. At the break, she came out of the 7 spot and straight to the lead to set the pace. 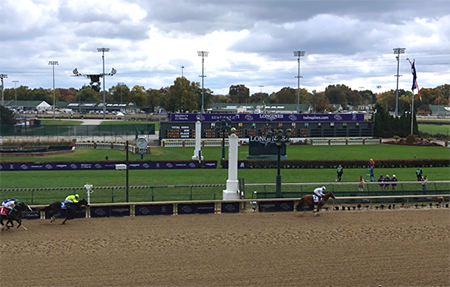 Nobody was going to stop her, even when RESTLESS RIDER challenged her at the top of the stretch, she dug deeper and pulled away to win by a good five lengths. The filly is trained by John C. Servis and partially owned by Bo Derek, who happened to be in the box seats right next to me! Say what! You seriously never know who you're going to see and where here. This was a much closer race than anticipated and had a bit of drama involved as well with a steward's inquiry involving UNCLE BENNY and LINE OF DUTY for a hard bump, but the results were unchanged. Early in the race it appeared that FORTY UNDER could have easily taken the race, but UNCLE BENNY and SOMELIKEITHOTBROWN challenged. In the end, LINE OF DUTY rallied for the win leaving the other two in place and show respectively. 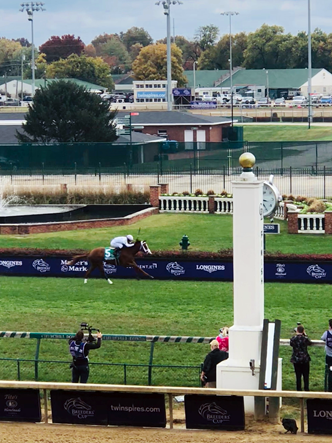 Finally the Breeders' Cup card ended with the $2M Juvenile. Two year old colts and geldings running a 1 1/16th mile. I have to admit this one was a bit stressful. It gets that way when you bet on a horse and they hang midpack for what feels like forever! That was the case with GAME WINNER and the crowd was getting a little worried in the backstretch and around the first turn. It felt like we pleaded him to the front and were so relieved when he crossed the wire ahead of the 40-1 longshot KNICKS GO. In the press conference, Bob was hesitant to say it for fear of heartbreak, but GAME WINNER may just be running for the roses in May. That wraps it up for a long day at Churchill. 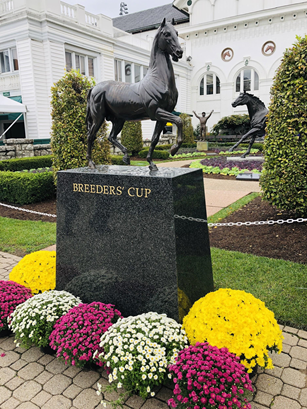 While you're visiting the track, definitely check out the gift shops for some great Breeders' Cup gear and souvenirs and for even more unique gifts, head to the Kentucky Derby Museum's Gift Shop. 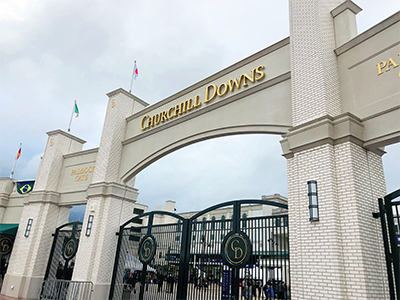 It's a shopping haven for Kentucky Derby and Secretariat fans. GET OUR COMPLETE BREEDERS' CUP PICKS AND WAGERING GUIDE!